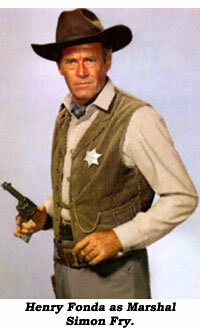 Do You Remember... "The Deputy"
Network TV on Saturday night in ‘59-‘61 was a banner night for western fans with “Bonanza”, “Wanted Dead or Alive”, “Have Gun Will Travel”, “Tall Man”, “Gunsmoke”—and “The Deputy” which brought distinguished film star Henry Fonda to the small screen as Simon Fry, Chief Marshal for the Arizona Territory in 1880. Fonda brought to TV the same determined authority he’d displayed in films like “My Darling Clementine” and “Fort Apache”. 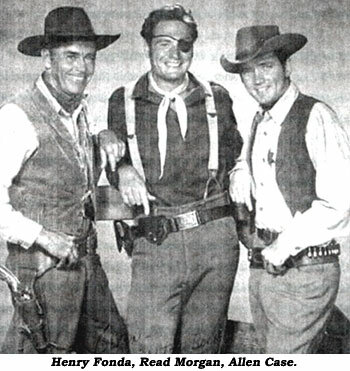 Although Fonda usually did a voice-over narration at the beginning and end of each episode and appeared in brief dialogue scenes, the real star of the Saturday night 9-9:30 (ET) 30 minute b/w NBC series was relative newcomer Allen Case as often reluctant deputy Clay McCord, otherwise employed as a general storekeeper with his sister Fran (Betty Lou Keim) in Silver City, AZ, (actually the Universal backlot). Fonda actually only “carried the mail” in six of the 39 1st season episodes (which began September 12, ‘59) and 13 of the 37 second season episodes (which ended July 1, 1961). Despite his adversity to violence, storekeeper McCord (Case) is an expert with a gun and, for that reason, Marshal Fry (Fonda) often tricks or drafts McCord into assisting him when the Marshal is not around. The gimmick wore thin, so with episode #29, “The Truly Yours”, after outlaws burn down McCord’s store, he quits resisting and elects to become a full-time deputy. The son of a retail clothier, Allen Case was born in Dallas, TX, in 1935 and attended Southern Methodist University for two years before dropping out to pursue a showbiz career. He sang on a Dallas TV station and toured in such musicals as “South Pacific” and “My Fair Lady”. His singing led to a five week stint on Arthur Godfrey’s morning show in ‘54 followed by gigs at Miami and Atlantic City niteries. He was signed by Columbia records in ‘55 and made a couple of rock ‘n’ roll records which were flops. Ballads were his real forté and, after “The Deputy” became a hit series, Columbia released a collection of songs more tuned to his abilities, “The Deputy Sings”. Created by Norman Lear and Roland Kibbee, “The Deputy” was on opposite the older-skewing “Lawrence Welk” on ABC while CBS pitted “Brenner”—a failure—then “Mr. Lucky” and finally “Checkmate” against the Fonda/Case series. Other regulars were old pro Wallace Ford (1899-1966) in the 1st season as aging town marshal of Silver City, Herk Lamson. Betty Lou Keim was McCord’s sister, Fran, who helped run the general store in the 1st season. 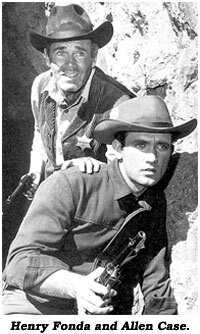 With McCord a full time deputy, both these characters were eliminated with the start of the second season and replaced by Read Morgan (1931– ) as one-eyed cavalry Sgt. Hapgood Tasker who was assigned to set up a supply office in Silver City. Sarge’s easy going relationship with McCord often functioned like a comedy sidekick. Other semi-regulars were Gary Hunley as Brandon McCord, eight year old brother of Fran and Clay; longtime character player Addison Richards as Doc Landy; Phil Tully as second season deputy Charlie; and Vito Scotti as local townsman Jose. WC spoke to Betty Lou Keim (right), born in Boston in 1938. Her father was a choreographer at the Cocoanut Grove in Boston when the tragic fire that took Buck Jones’ life occurred on November 28, 1942, killing 492 people. “That night,” she explained, “was my father’s birthday. They kept him home that night because it was going to be a surprise party!” Moving to New York with her parents, Betty Lou attended a school for professional children and was picked to do a Broadway show, “Strange Fruit” in ‘45. Other Broadway shows followed before she came to Hollywood. 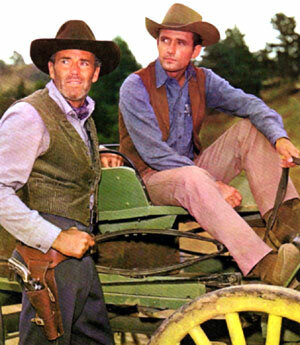 When the series ended, Case continued to work, co-starring as Frank James with Christopher Jones as Jesse in the short-lived “Legend of Jesse James” (‘65-‘66). Case returned to Dallas in the ‘80s. He was on vacation in Truckee, CA, when he collapsed and died of a heart attack at 51 on August 25, 1986. Fonda continued to work up until “On Golden Pond” in ‘81 and died of heart disease August 12, 1982 at 77. Betty Lou Keim died January 27, 2010, in Chatsworth, CA.